Chagas disease, also known as American trypanosomiasis, is caused by infection with the protozoan parasite Trypanosoma cruzi. The organism T cruzi and infection in humans were first described in 1909 by the Brazilian physician Carlos R. J. Chagas. 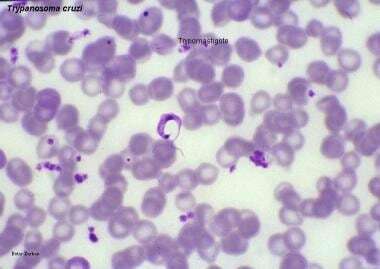 [1, 2, 3] T cruzi is found mostly in blood-sucking triatomine insects (kissing bugs) and small mammals in a sylvatic cycle that is enzootic from the southern and southwestern United States to central Argentina and Chile. T cruzi infection in humans occurs in a spotty distribution throughout the range of the sylvatic cycle. T cruzi infection is life-long. A minority of persons with long-standing T cruzi infection develop the serious cardiac and gastrointestinal problems that characterize chronic symptomatic Chagas disease. T cruzi is a member of the family Trypanosomatidae in the order Kinetoplastida and belongs to a special section called Stercoraria. The infective forms of T cruzi are contained in the feces of the insect vectors and gain entry into its mammalian hosts through contamination. This mechanism of transmission contrasts with that of the two subspecies of African trypanosomes that cause human disease, Trypanosoma brucei gambiense and Trypanosoma brucei rhodesiense, which are transmitted via the saliva of their vectors, and with the mechanism by which the nonpathogenic trypanosome found in the Americas, Trypanosoma rangeli, is transmitted to its mammalian hosts. As with other parasites that infect both mammalian and insect hosts, the life cycle of T cruzi is complex (see image below). The T cruzi life cycle consists of 3 main developmental forms. Epimastigotes are an extracellular and noninfective form of the parasite found in the midgut of insect vectors, where they multiply by binary fission. As epimastigotes (depicted in the first image below) move to the hindgut, they differentiate into metacyclic trypomastigotes (depicted in the second image below), which are nondividing forms resistant to mammalian complement that have the capacity to infect mammalian cells. They enter local cells through breaks in the skin, mucous membranes, or the conjunctivas and transform into the third morphologic form, amastigotes. Amastigotes multiply intracellularly until the host cell is overwhelmed, at which point they transform into bloodstream trypomastigotes. 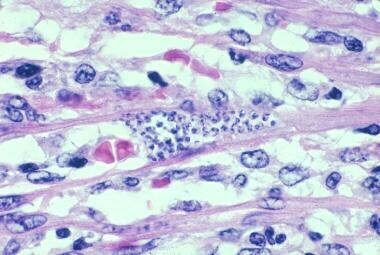 As the host cells rupture, the trypomastigotes are released into the lymphatics and bloodstream, through which they spread to distant sites and invade new host cells. See image below. This process continues asynchronously for the life of the host. 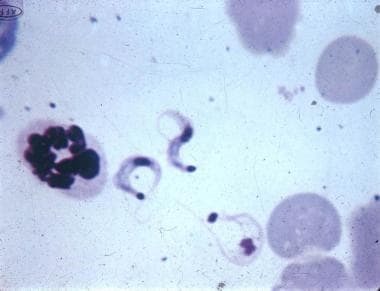 Small numbers of trypomastigotes may be ingested in blood meals taken by uninfected triatomines. 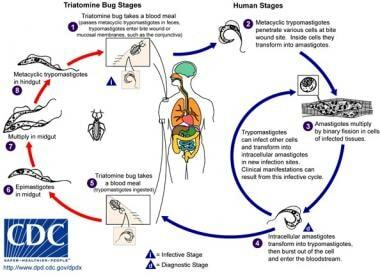 The trypomastigotes then transform into epimastigotes in the midgut of these insects, thus completing the cycle. T cruzi can also be transmitted when mammalian hosts ingest infected insects, and this mechanism of transmission may play a major role in maintaining the sylvatic cycle. Numerous biological, biochemical, and molecular studies have shown that the population of T cruzi is highly diverse. [5, 6, 7] Although T cruzi is a diploid organism in which some genetic exchange may occur in insect vectors,  its genetic and phenotypic diversity is thought to result from the clonal multiplication of the epimastigote and amastigote forms. The current consensus is that T cruzi can be divided into 6 discrete taxonomic units (DTUs; TcI through TcVI). The strains in each DTU show variability in geographic, epizootic, epidemiologic, and pathogenic characteristics. [9, 10, 11] Unfortunately, no clear associations have been found between the strain groups and pathogenicity or drug susceptibility. In general, the extensive genetic and, more recently, proteomics data generated so far, including the framework of the DTUs, have not yet led to new tools to reduce transmission, advances in the management of clinical disease, new drugs, or a vaccine. In the area of diagnosis, however, the results of molecular work on T cruzi have led to the development of accurate assays that are used widely to detect T cruzi infection. Triatomines, which transmit T cruzi, belong to the family Reduviidae in the order Hemiptera. Reduviidae has 22 subfamilies, including the Triatominae. [12, 13, 14] Although the vectors of T cruzi are occasionally referred to as reduviids, this term is not appropriate since the vast majority of the species in the family Reduviidae are phytophagous or insectivorous and do not transmit the parasite. All triatomine species are able to transmit T cruzi to humans, but only a handful become domiciliary to any great extent and are important as T cruzi vectors. Many more triatomine species are involved in the widespread sylvatic cycles. Triatomines have 5 nymphal stages (instars), all of which can harbor and transmit T cruzi. The three vector species most important in the transmission of T cruzi to humans include Triatoma infestans, Rhodnius prolixus (see image below), and Triatoma dimidiata. Historically, T infestans has been by far the most important, as it has been the primary vector in the sub-Amazonian endemic regions. Since the early 1990s, under the aegis of the Southern Cone Initiative (SCI), which is supported by the World Health Organization (WHO) and the Pan American Health Organization (PAHO), Chagas disease control programs in Argentina, Bolivia, Brazil, Chile, Paraguay, and Uruguay have focused on eliminating domiciliary T infestans. Major progress in vector control has also been achieved in Argentina, Paraguay, and Bolivia. Programs similar to the SCI have been implemented in the Andean nations and Central America, where R prolixus is typically found. [19, 20] The range of T dimidiata is similar but also extends far into Mexico. Other domiciliary species occupy more restricted areas and play less-important roles in the transmission of T cruzi to humans. 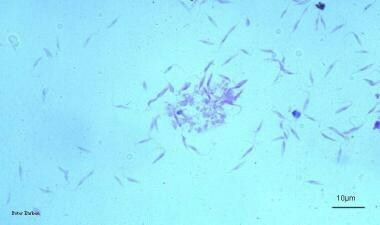 The sylvatic species can also colonize human dwellings and thus present a potential risk for transmission. Livestock have occasionally been found to be infected with T cruzi, but the parasite is not known to adversely affect their health. Birds, amphibians, and reptiles are naturally resistant to T cruzi infection. In some situations, however, birds may be important sources of blood meals for triatomines. Not surprisingly, T cruzi can also be transmitted via transplantation of organs obtained from persons with chronic infection, and occasional reports of this in Latin America [31, 32] and in the United States [33, 34, 35] have appeared. The heart is the most commonly affected organ in persons with chronic Chagas disease. 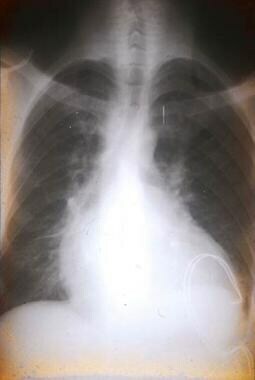 [55, 56, 57, 58] Autopsy may reveal marked bilateral ventricular enlargement, often involving the right side more than the left, in the heart of patients who die of chagasic heart failure (see image below). The ventricular walls are often thin, and mural thrombi and apical aneurysms may be present. In addition, diffuse interstitial fibrosis, widespread lymphocytic infiltration, and atrophy of myocardial cells may all be present. T cruzi parasites are rarely found during microscopic examination of stained sections of myocardial tissue; however, in numerous studies, T cruzi ‑specific polymerase chain reaction (PCR) assays have demonstrated parasites in areas of focal inflammation. [59, 60, 61] Pathologic changes in the conduction systems of chronic chagasic hearts are also common and often correlate with dysrhythmias. Chronic inflammatory lesions and dense fibrosis frequently involve the right branch and the left anterior branch of the bundle of His, but lesions may also be found in other segments of the conduction system. 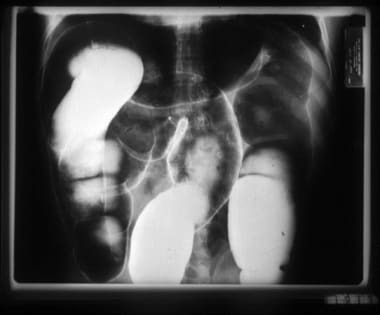 Salient features on gross examination of the colon or esophagus in patients with chronic chagasic gastrointestinal disease (megadisease) include dilatation and muscular hypertrophy of the affected organs (see images below). [63, 64, 65, 66, 67, 68] Focal inflammatory lesions with lymphocytic infiltration are visible on microscopy. The number of neurons in the myenteric plexus is often markedly reduced, and periganglion and intraganglion fibrosis with accompanying Schwann cell proliferation, along with lymphocytosis, are present. In most patients with megadisease, the functional effects of this parasympathetic denervation are limited to the esophagus or colon, but clinically manifest dysfunction of the ureters, biliary tree, and other hollow viscera has been reported. Despite the presence of the sylvatic cycle of T cruzi transmission in the southern and southwestern United States, only 23 cases of autochthonous transmission of the parasite have been reported. [52, 73, 74] Although some cases of T cruzi infection probably go unnoticed or unreported, autochthonous acute Chagas disease is rare in the United States. This concept is supported by the extreme rarity of T cruzi infection among US blood donors who were not born in or who have not traveled extensively in endemic countries. The rarity of vector‑borne transmission of T cruzi to humans in the United States is likely due to the overall sparsity of vectors and the generally higher housing standards, which help prevent the vectors from becoming domiciliary. Two FDA‑approved tests are currently available for screening US blood donors for Chagas disease: the Ortho T cruzi ELISA Test System (Ortho Clinical Diagnostics, Rochester, NY) [83, 84] and the Abbott Prism Chagas assay (Abbott Laboratories, Abbott Park, IL). Donor samples positive in either of the two screening assays generally undergo confirmatory testing with the Abbott Enzyme Strip Assay (ESA) Chagas, which is the only FDA‑approved option for this purpose. [86, 87] The Chagas RIPA, [88, 89] which was used for confirmatory testing from 2007-2014, is no longer available for this purpose. The data accumulated to date indicate that about 1 in every 13,000 US blood donors is infected with T cruzi (ie, repeat reactive in the Ortho or Abbott screening assays and positive in the Chagas RIPA or the Abbott ESA),  which is consistent with estimates made prior to the initiation of screening by groups familiar with the epidemiology of T cruzi in the United States. No instances of transfusion transmission of T cruzi in the United States are known to have occurred since donor screening was implemented. As noted above, in recent years, the epidemiology of T cruzi infection has improved markedly in many endemic countries, as blood bank and vector-control programs have been implemented. Because of the success of programs directed at domiciliary vector programs, prevalence rates in younger age groups have been decreasing substantially in many areas. [17, 18, 96, 97, 98] All endemic countries have adopted statutory or regulatory mandates for screening donated blood for T cruzi, the most recent of which was Mexico. [30, 29, 99] . 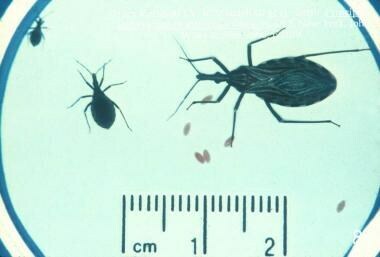 Approximately 12,000 deaths attributable to Chagas disease occur annually, typically due to chronic heart disease [56, 58, 105, 106] or, less frequently, megadisease or meningoencephalitis. In persons with chronic chagasic heart disease, mortality is primarily due to the rhythm disturbances and congestive heart failure that result from the chronic inflammatory cardiomyopathy driven by the persistent presence of parasites in heart tissue. Embolization of intraventricular clots to the cerebrum and lungs can also contribute to mortality. 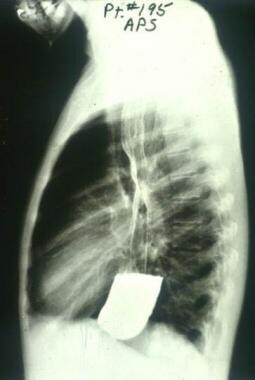 Persons with severe megaesophagus who do not receive medical attention can die of malnutrition and/or chronic aspiration pneumonitis. 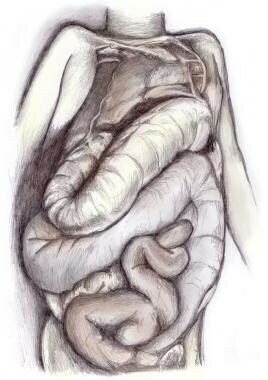 Megacolon (depicted in the image below) can also result in death, usually when volvulus develops and is not resolved surgically. T cruzi infection does not have a racial predilection. T cruzi infection does not have a sexual predilection. Morbidity during the acute phase of Chagas disease is more pronounced in children than in adults. The gastrointestinal and cardiac manifestations of chronic T cruzi infection become apparent many years or even decades after initial infection and thus occur almost exclusively in adults. However, the lifetime risk for the development of such symptoms in chronically infected persons is only 10%-30%.